Incidence of breast cancer and associated mortality among Canadian women in 2007. Sources: Canadian Cancer Registry and Canadian Vital Statistics — Death Databases, Statistics Canada. Outcomes of screening for breast cancer such as tumour detection and mortality must be put into context of the harms and costs of false-positive results, overdiagnosis and overtreatment. Consideration of benefits, harms and costs is complicated by variations in risk factors and in the types and stages of cancer. Any positive result from screening has emotional costs such as anxiety and worry for patients and their families, and financial costs to both the patient and the health care system as a result of additional and potentially unnecessary diagnostic tests. For women with positive results on screening tests, additional diagnostic tests will usually be recommended, such as further mammography, ultrasound and/or tissue sampling with core needle biopsy. This document updates the previous guidelines issued by the Canadian Task Force on Preventive Health Care (2001).5,6 The absence of current Canadian recommendations, the recent controversy over the best way to screen for breast cancer among women at average risk of the disease,7,8 the availability of new technologies such as magnetic resonance imaging (MRI) and a recent review of the evidence9 were the basis for selecting this topic for an update by the revitalized Canadian Task Force on Preventive Health Care. Recommendations are presented for the use of mammography, MRI, breast self-examination and clinical breast examination to screen for breast cancer among women at average risk of disease (defined as those with no previous breast cancer, no history of breast cancer in a first-degree relative, no known mutations in the BRCA1/BRCA2 genes or no previous exposure of the chest wall to radiation). Recommendations are provided separately for women aged 40–49, 50–69 and 70–74 years and are aimed at clinicians and policy-makers. The recommendations are intended to inform both organized and opportunistic screening. Work on each recommendation is led by a workgroup of two to five members of the task force; a list of members of the workgroup for the current guidelines is available at the end of this article. Each workgroup establishes the research questions and analytical framework for the guideline. The Evidence Review and Synthesis Centre (the details of which are available at www.canadiantaskforce.ca/about_eng.html) assembles a team of methodologists who will perform the systematic review, usually in conjunction with one or more clinical experts. The team provides input on the analytical framework, then summarizes the evidence using a systematic review and quantitative summary of the relevant available evidence; narrative summaries are developed when quantitative synthesis is not feasible. A list of members of the evidence review team for the current guidelines is available at the end of this article. Once the systematic review is available from the evidence review team, the task force workgroup independently develops the recommendation statements by consensus, based on a detailed review of the evidence. In formulating recommendations, workgroups consider both the benefits and harms associated with a screening test, patient values and preferences, the quality of the evidence and, in some cases, the costs of the intervention (Box 1). The strength of evidence is determined using the Grades of Recommendation Assessment, Development and Evaluation (GRADE) system.10 The draft recommendations as developed by the workgroup are revised and approved by the entire task force. Recommendations are graded as either strong or weak according to the Grades of Recommendation Assessment, Development and Evaluation system (GRADE).10 GRADE offers two strengths of recommendation: strong and weak. The strength of recommendations is based on the quality of supporting evidence, the degree of uncertainty about the balance between desirable and undesirable effects, the degree of uncertainty or variability in values and preferences, and the degree of uncertainty about whether the intervention represents a wise use of resources. Weak recommendations are those for which the desirable effects probably outweigh the undesirable effects (weak recommendation for an intervention) or undesirable effects probably outweigh the desirable effects (weak recommendation against an intervention) but appreciable uncertainty exists. A weak recommendation implies that most women would want the recommended course of action, but many would not. For clinicians, this means they must recognize that different choices will be appropriate for individual women, and they must help each woman arrive at a management decision consistent with her own values and preferences. Policy-making will require substantial debate and involvement of various stakeholders. Weak recommendations result when the balance between desirable and undesirable effects is small, the quality of evidence is lower, and there is more variability in the values and preferences of patients. Although members of a task force workgroup are not necessarily content experts in the clinical area of the guideline, a content expert is part of the evidence review team, and the research questions, systematic review and recommendations undergo internal and external peer review by experts in the field and by stakeholders and partners, such as the Canadian Breast Cancer Screening Initiative for these guidelines. Details about the task force’s methods can be found elsewhere11 and in Appendix 1 (available at www.cmaj.ca/lookup/suppl/doi:10.1503/cmaj.110334/-/DC1). The Breast Cancer Workgroup established key questions and an analytic framework for the systematic review on screening for breast cancer (Figure 2). Key questions were addressed by systematic review. Contextual questions (issues judged not to require a systematic review, but that were addressed by targeted literature searches) are also shown in Figure 2. Analytical framework and key questions posed by the workgroup. MRI = magnetic resonance imaging. Because previous guidelines have emphasized the benefit of mammography for screening women aged 50–69 years, the focus of the review was women aged 40–49 years and women aged 70 years and older; data were collected for women aged 40 years and older. Randomized and quasi-randomized controlled trials were used to determine the effectiveness of screening interventions (Figure 2, key questions 1a, 1b and 1c). Observational studies and mathematical models were not used to assess efficacy owing to their potential for bias and because there was sufficient trial data to answer the key research questions. Randomized trials often fail to capture detailed information on clinically relevant harms and generally do not study patient values and preferences. We used observational data to assess these issues (Figure 2, key questions 2a, 2b and 2c, and contextual questions). A summary of the recommendations for clinicians and policy-makers is shown in Box 2. More detailed explanations of the recommendations are available in Appendices 2 and 3 (available at www.cmaj.ca/lookup/suppl/doi:10.1503/cmaj.110334/-/DC1). Recommendations are presented for the use of mammography, magnetic resonance imaging (MRI), breast self-examination and clinical breast examination to screen for breast cancer (see Box 1). These recommendations apply only to women at average risk of breast cancer aged 40 –74 years. They do not apply to women at higher risk because of personal history of breast cancer, history of breast cancer in first-degree relatives, known mutations of the BRCA1/BRCA2 genes or previous exposure of the chest wall to radiation. No recommendations are made for women aged 75 years and older, given the lack of data available for this group. Mammography is associated with significant reductions in the relative risk of death from breast cancer among women aged 40–49 years (Table 1).13 However, the absolute benefit is lower for this age group than for older women because of the younger group’s lower risk of cancer. We calculated the number needed to screen (NNS), defined here as the number of women who would need to be screened about once every 2 years over a median of about 11 years to prevent a single death from breast cancer. Because not all women in the randomized trials who were invited to attend screening actually had mammography, these NNS may underestimate the absolute benefit of screening. No primary studies looked at the risk of overdiagnosis (diagnosis of breast cancer that will not affect life expectancy or quality of life) specifically among women aged 40–49 years, but studies involving older women have estimated that the frequency of overdiagnosis ranges from 30% to 52%.12 Data from our systematic review show that for every 1000 women aged 39 years and older who are screened using mammography, 5 will have an unnecessary lumpectomy or mastectomy as a result of overdiagnosis.12 In addition to unnecessary intervention, false-positive results can lead to fear, anxiety and distress.14 In the judgment of the task force, this ratio of potential benefit to harm does not justify routine screening in women aged 40–49 years. This recommendation places a relatively low value on a very small absolute decrease in mortality and reflects concerns with false-positive results, the incidence of unnecessary biopsies and overdiagnosis of breast cancer. The implications of a weak recommendation are that most women would follow the recommended course of action, but many would not. Clinicians should discuss the benefits and harms with their patients and must help each woman to make a decision that is consistent with her values and preferences. Women who place a higher value on a small reduction in mortality and are less concerned about undesirable consequences are likely to choose screening. Because it is likely that the benefit of screening increases in a continuous fashion with increasing age (rather than a sharp increase at 50 years of age), women aged 40–49 years may be more inclined to receive screening as they grow older, even if their preferences do not change. Mammography is associated with significant reductions in the relative risk of death from breast cancer in this age group, and the absolute benefits are greater than those seen among women aged 40–49 years (Table 1). The benefits of mammography for women aged 60–69 years (NNS 432) are greater than for women aged 50–59 years (NNS 910). Screening about 720 women aged 50–69 years once every 2–3 years for about 11 years would prevent 1 death from breast cancer, but it would also result in about 204 women having a false-positive result on a mammogram and 26 women having an unnecessary biopsy of their breast (Table 2).12 In the judgment of the task force, the larger absolute benefits for women aged 50–69 years justify a weak recommendation for screening, in contrast to the recommendation for women aged 40–49 years. The absolute benefits of screening remain small among women aged 50–69 years, and a substantial proportion of women will have false-positive results on mammography leading to unnecessary and invasive investigation. Again, the potential benefits and harms of screening should be discussed with each patient in the context of her preferences. Women aged 50–69 years who do not place a high value on a small reduction in mortality and who are concerned about false-positive results, unnecessary diagnostic testing and potential overdiagnosis of breast cancer are likely to decline screening. The reduction in relative risk of death from breast cancer associated with mammography for women aged 70–74 years is statistically non-significant (Table 1). However, the point estimate for relative risk is similar to that seen for younger women, and the 95% confidence intervals extend only marginally above unity. Given the higher absolute risk in this age group, these considerations suggest that the absolute benefits of mammography are likely to be similar to those seen among women aged 50–69 years. However, patient preferences remain important for determining who should and should not be screened. Screening about 450 women aged 70–74 years once every 2–3 years for about 11 years would prevent 1 death from breast cancer, but it would also result in about 96 women having a false-positive result on a mammogram and 11 women having an unnecessary biopsy of their breast (Table 2).12 Women aged 70–74 years who do not place a high value on a small reduction in mortality and who are concerned about false-positive results, unnecessary diagnostic testing and potential overdiagnosis of breast cancer are likely to decline screening. The trials included in our review screened women at intervals ranging from 12 to 33 months (median 22 mo).15–21 The optimal frequency of screening cannot be determined at present, but data from the sole randomized trial comparing different screening intervals suggest no significant difference between screening intervals of one year and three years. However, that trial was not adequately powered to detect a small benefit of more frequent screening.22 Pooled analyses suggest that the effect of screening on mortality is similar in trials with a screening interval of 24 months or more and those with a screening interval of less than 24 months (Table 3). Further stratified analyses suggested that the benefit of screening appeared similar in trials with screening intervals of 33 months (two trials involving 98 431 women; relative risk [RR] 0.70, 95% confidence interval [CI] 0.45–1.09),16,18 24 months or longer (three trials involving 193 905 women (RR 0.77, 95% CI 0.58–1.03)16,18 and annually (four trials involving 311 165 women; RR 0.87, 95% CI 0.77–0.99).15,17,20,21 The small number of women screened at intervals of 33 months did not permit further stratification by age. Therefore, for women aged 50–74 years, we suggest a screening interval of two to three years, which appears to preserve the benefit of annual screening but reduces adverse effects, inconvenience to women and cost. Since no studies show that the type of mammography influences the anticipated reduction in mortality associated with screening, either digital or film mammography is acceptable. There are no data evaluating whether screening women at average risk of breast cancer using MRI scans reduces mortality as compared with mammography or no screening. Thus, screening women at average risk using MRI scans is not recommended. We did not identify data addressing the benefits of screening mammography for women more than 74 years of age. It is possible that screening might reduce breast cancer mortality in this group. Given the small absolute reduction in mortality associated with screening, benefit is unlikely among people with limited life expectancy. Practitioners should communicate this information to patients so that it can be considered during joint decision-making about whether to proceed with screening. Although available data suggest that some women would prefer to undergo screening despite its potential harms, many would not.28–33 These data show that determining the preferences of individual women about the relative importance of potential benefits and harms is critical in determining who should undergo screening. Sources of information for women should accurately portray the value of mammography and the potential for harm rather than simply provide encouragement.7,34 For example, the Public Health Agency of Canada has created a leaflet to assist women with deciding whether or not to undergo screening.35 In addition, one-page information sheets are available for both clinicians and patients to help with shared decision-making (Appendix 3; additional knowledge translation tools are available at http://canadiantaskforce.ca/patient-resources.html and at http://canadiantaskforce.ca/GRADE.html). Introducing organized screening programs appears to increase the proportion of women who undergo mammography; such programs should be structured to encourage women to make an informed decision about whether to participate. In some provinces, women may self-refer to organized screening programs; our recommendations are relevant to physicians advising their patients about the potential merits of mammography within or outside of such programs. Reminders linked to an electronic medical record might be helpful for increasing the proportion of women with whom the risks and benefits of mammography are discussed, but this would require further study. Certain ethnic groups may have higher (e.g., Ashkenazi Jews)36 or lower (East Asians)33 risk of death from breast cancer, which may alter the absolute benefit of screening. Rates of screening are low among Aboriginal populations,37,38 women with low incomes and recent immigrants;39 further work is needed to explain these findings and determine their potential impact. Access to high-quality facilities with the necessary equipment and expertise in mammography is required for screening. Provincial and regional decision-makers should consider whether access is adequate for people in their jurisdictions who reside outside of major centres. Mobile screening units may help to increase access to screening among women who live in rural or remote communities. An ideal performance measure for preventive services would allow clinicians to assess the quality of care that they are delivering to patients, and allow the writers of guidelines to assess whether their recommendations have influenced clinical practice. The objective of these guidelines is to improve health among women aged 40–74 years, which requires balancing the potential benefits and harms of using mammography to screen for breast cancer. Although uptake rates of screening are often used as performance measures, women aged 50–74 years who are well-informed might reasonably choose not to undergo mammography. Therefore, performance measures based solely on the number or proportion of women in each age group who undergo mammography may not be suitable. Available data suggest that screening with mammography every two years is associated with costs per quality-adjusted life year that are generally considered to represent good value for money in developed countries.41,42 However, many such analyses are based on observational data, which may overestimate the potential benefit of screening compared with trial data. Longer screening intervals will be more economically attractive than shorter screening intervals, assuming that the benefit in terms of reducing breast cancer mortality is retained, as the available evidence suggests. The current guideline differs from previous recommendations made by the Canadian Task Force on Preventive Health Care by lengthening the screening interval from one year to two to three years. Several other organizations have developed recommendations for screening for breast cancer (Table 4).5,6,43–45 The US Preventive Services Task Force and the National Health Service in the United Kingdom recommend routine screening for women aged 50–74 years, but not for women aged 40–49 years. The US Preventive Services Task Force recommends screening for women aged 50–74 years every two years, whereas the National Health Service recommends screening for women aged 50–70 years every three years. The explanation for these differences may be varying judgments about the quality of available evidence. The Canadian Task Force on Preventive Health Care will update this guideline within five years of publication. Although improvements in technology suggest that screening may be more effective now than in the past, mortality among women with breast cancer continues to decline (perhaps due to better adjuvant treatment). It is possible, though speculative, that the absolute benefit attributable to screening might have declined in parallel. Because all of the trials identified by our review used film mammography, determining whether digital mammography or MRI scan of the breast improve the benefit associated with screening (especially for younger women) would require further randomized trials, which would be of great interest to clinicians, patients and policy-makers. Finally, given the importance of patients’ preferences for appropriate decision-making, further studies are needed to determine the best way to communicate information about the potential benefits and harms of mammography. Although screening mammography reduces mortality from breast cancer among women aged 40–74 years, the absolute benefit is small — especially for younger women — and is partially offset by harms caused by unnecessary intervention. Despite its potential to reduce mortality, appropriate use of mammography will require thoughtful discussion between clinicians and patients about the balance between benefits and harms. Finally, available evidence does not support the use of MRI scans, clinical breast examination or breast self-examination to screen for breast cancer among women at average risk. The reduction in mortality associated with screening mammography is relatively small for women aged 40–74 years at average risk of breast cancer. A greater reduction in mortality is seen with mammography for women at average risk aged 50–74 years than among similar women aged 40–49 years; however, harms of overdiagnosis and unnecessary biopsy may be greater for younger women than for older women. When deciding whether to recommend mammography to a specific patient, providers should first discuss the tradeoff between benefits and harms, as well as the patient’s values and preferences. For women at average risk who choose to have screening mammography, an interval of every two to three years appears appropriate. There is no evidence that screening women at average risk of breast cancer using magnetic resonance imaging, clinical breast examination or breast self-examination reduces the risk of mortality or other clinically relevant adverse outcomes. The authors thank members of the research team from the Evidence Review and Synthesis Centre who conducted the systematic review upon which these recommendations were based, the staff at the Task Force Office of the Public Health Agency of Canada, and the peer reviewers whose thoughtful comments helped to improve the quality of this manuscript. Competing interests: Marcello Tonelli, Michel Joffres, James Dickinson, Harminder Singh, Gabriela Lewin and Richard Birtwhistle have received support for travel to meetings from the Public Health Agency of Canada. Gabriela Lewin is an employee of Kemptville District Hospital. No other competing interests were declared. Guidelines writing group: Marcello Tonelli, Sarah Connor Gorber, Michel Joffres, James Dickinson, Harminder Singh, Gabriela Lewin, Richard Birtwhistle. Systematic review writing group: Donna Fitzpatrick-Lewis, Nicole Hodgson, Donna Ciliska, Marcello Tonelli, Mary Gauld, Yan Yun Liu. Canadian Cancer Society/National Cancer Institute of Canada. Canadian Cancer Statistics 2007. Toronto (ON): The Society; 2007.
. An update on mammography use in Canada. Health Rep 2009;20:7–19.
. Breast self-examination: resistance to change. Can Fam Physician 2005;51: 698–9.
. Explanations for the preventive care checklist form. Can Fam Physician 2006;52:48–55. ; Canadian Task Force on Preventive Health Care. Preventive health care, 2001 update: screening mammography among women aged 40–49 years at average risk of breast cancer. CMAJ 2001;164:469–76.
. Screening for breast cancer. In: The Canadian guide to clinical preventive health care. Ottawa (ON): Health Canada; 1994.
. Screening mammography — a long run for a short slide? N Engl J Med 2010;363:1276–8.
. Lessons from the mammography wars. N Engl J Med 2010;363:1076–9.
. Screening for breast cancer: systematic evidence review update for the US Preventive Services Task Force. Rockville (MD): Agency for Healthcare Research and Quality; 2009. Report No. : 10-05142-EF-1. Canadian Task Force on Preventive Health Care. Procedure manual. Available: http://canadiantaskforce.ca/methods-manual-2011.html (accessed 2011 Oct. 17).
. Breast cancer screening. Available: http://canadiantaskforce.ca/recommendations/2011_01_eng.html (accessed 2011 Oct. 17).
. Meta-analyses of the effect of false-positive mammograms on generic and specific psychosocial outcomes. Psychooncology 2010;19:1026–34.
. Age-specific reduction in breast cancer mortality by screening: an analysis of the results of the Health Insurance Plan of Greater New York study. J Natl Cancer Inst 1986;77:317–20.
. Canadian national breast screening study: 1. Breast cancer mortality after 11 to 16 years of follow-up. A randomized screening trial of mammography in women age 40s. Ann Intern Med 2002;137:305–12.
. Long-term effects of mammography screening: updated overview of the Swedish randomised trials. Lancet 2002;359:909–19.
. Effect of mammographic screening from age 40 years on breast cancer mortality at 10 years’ follow-up: a randomised controlled trial. Lancet 2006;368:2053–60.
. Canadian national breast screening study: 2. 13-year results of a randomized trial in women aged 50–59 years. J Natl Cancer Inst 2000;92:1490–9. The Breast Screening Frequency Trial Group. The frequency of breast cancer screening: results from the UKCCCR randomized trial. Eur J Cancer 2002;38:1458–64. Canadian Cancer Society. Treatment for breast cancer. Toronto (ON): The Society; 2011. Available: www.cancer.ca/sitecore/content/Home/Canada-wide/About%20cancer/Types%20of%20cancer/Treatment%20for%20breast%20cancer.aspx (accessed 2011 Oct. 13).
. with the Canadian Task Force on Preventive Health Care. Preventive health care, 2001 update: Should women be routinely taught breast self-examination to screen for breast cancer? CMAJ 2001;164:1837–46.
. Regular self-examination or clinical examination for early detection of breast cancer [review]. Cochrane Database Syst Rev 2003;(2):CD003373.
. Screening for breast cancer with mammography [review]. Cochrane Database Syst Rev 2011;CD001877.
. A review of studies examining stated preferences for cancer screening. Prev Chronic Dis 2006;3:A75.
. Breast cancer-related preferences among women with and without BRCA mutations. Breast Cancer Res Treat 2010;119:177–84.
. Screening mammography: Do women prefer a higher recall rate given the possibility of earlier detection of cancer? 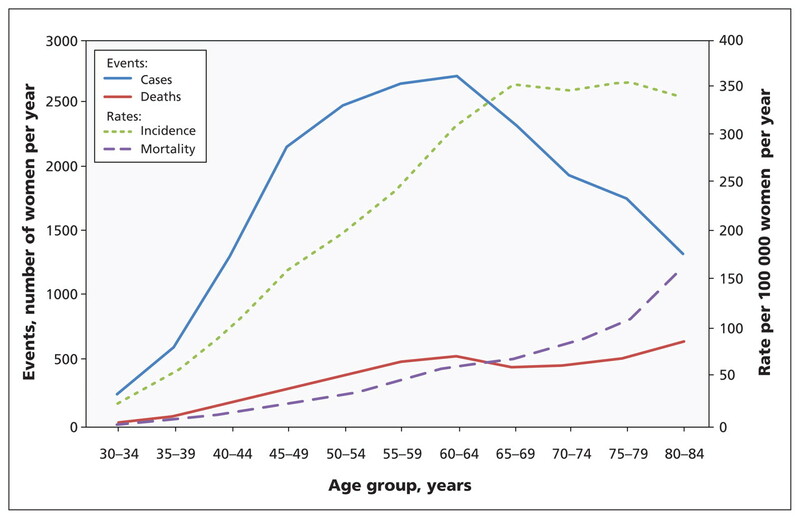 Radiology 2006;238:793–800.
. Effect of screening programme on mortality from breast cancer. Women might not accept mammography if benefit is lower than is currently thought. BMJ 2000;321:1527–8.
. Cancer incidence among Canadian immigrants, 1980–1998: results from a national cohort study. J Immigr Minor Health 2011;13:15–26.
. Breast screening: the facts — or maybe not. BMJ 2009;338:b86. Public Health Agency of Canada. 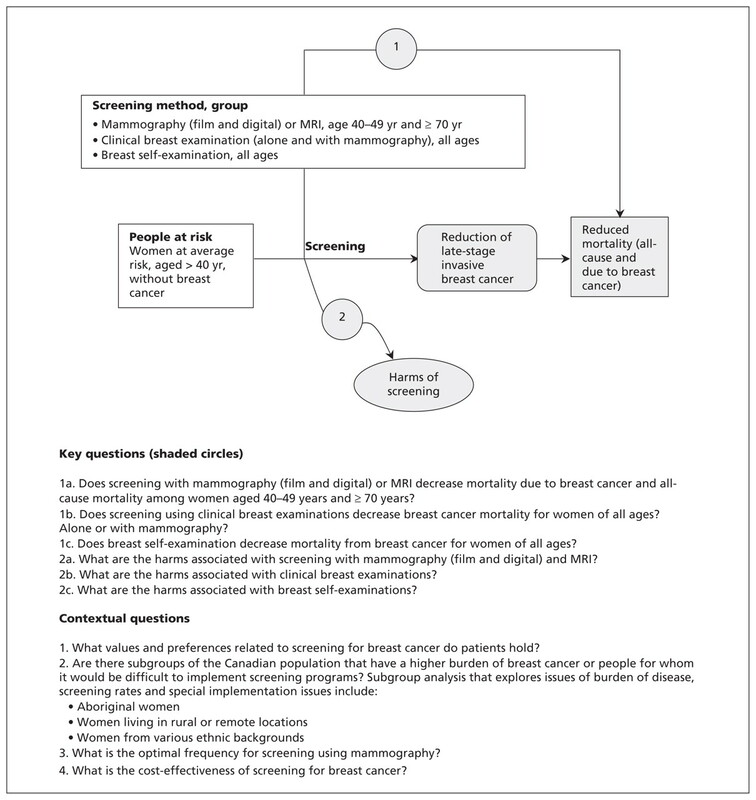 Information on mammography for women aged 40 and older: a decision aid for breast cancer screening in Canada. Ottawa (ON): The Agency; 2009. Available: www.phac-aspc.gc.ca/cd-mc/mammography-mammographie-eng.php (accessed 2011 Oct. 17).
. The risk of cancer associated with specific mutations of BRCA1 and BRCA2 among Ashkenazi Jews. N Engl J Med 1997;336:1401–8. Access to cancer screening and First Nations. Ottawa (ON): Assembly of First Nations; 2009. Available: http://64.26.129.156/cmslib/general/AFN%20Cancer%20Screening%20Review-final-ENG.pdf (accessed 2011 Jan. 6).
. Detection of later stage breast cancer in First Nations women in Ontario, Canada. Can J Public Health 2010;101:101–5. Quality Determinants of organized breast cancer screening programs, 2003. Ottawa (ON): Public Health Agency of Canada; 2003.
. Cost-effective mammography screening in Korea: high incidence of breast cancer in young women. Cancer Sci 2009;100:1105–11.
. Cost-effectiveness analysis of mammography and clinical breast examination strategies: a comparison with current guidelines. Cancer Epidemiol Biomarkers Prev 2009;18:718–25. US Preventive Services Task Force. Screening for breast cancer: US Preventive Services Task Force recommendation statement. Ann Intern Med 2009;151:716–26. NHS Breast Screening Programme. London (UK): National Health Service. Available: www.cancerscreening.nhs.uk/breastscreen/ (accessed 2011 Oct. 13).
. Diagnostic performance of digital versus film mammography for breast-cancer screening. N Engl J Med 2005;353:1773–83. Toward Risk-Based Breast Cancer Screening and Prevention Strategies for Survivors of Hodgkin's Lymphoma: One Step Closer?